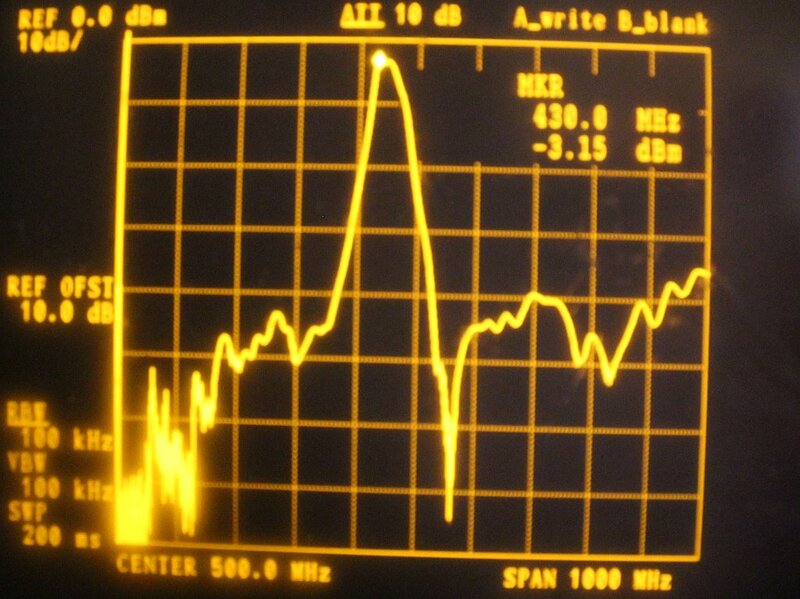 Here's a couple of UHF filters uncovered in the shack during a clean-up, and that I thought would be fun to put on the spectrum analyser and see what happened. 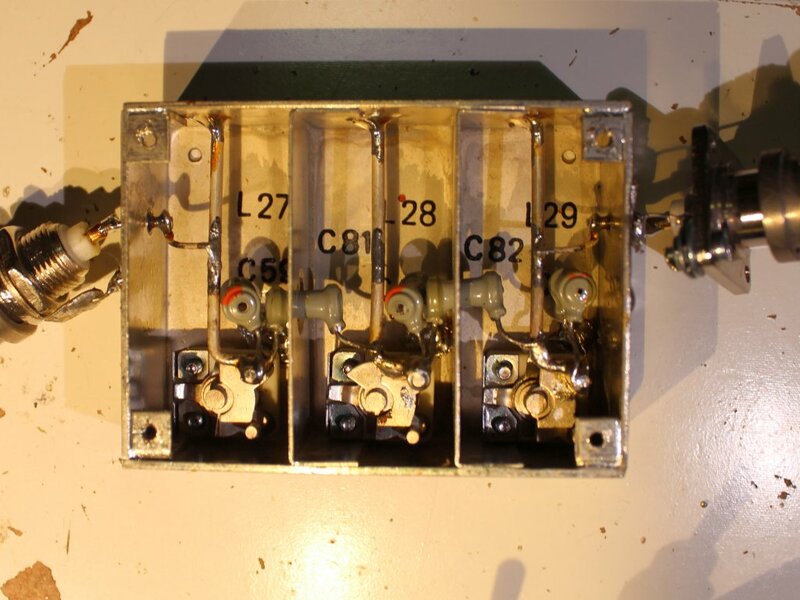 This one was found at a hamfest, if I recall correctly it was one of those times when you see a "Free" box under the table in the junkiest part of the flea market. Just some stuff nobody wants and the seller wants to be rid of. 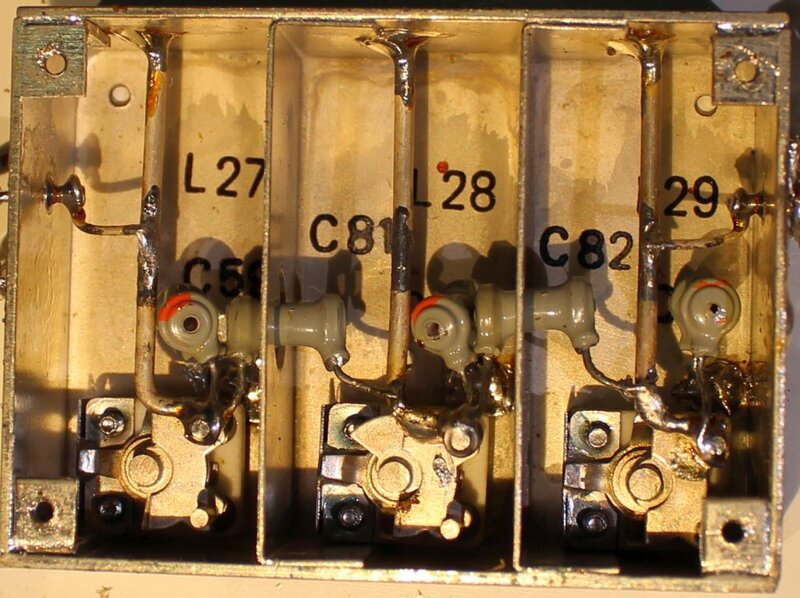 This one had no markings and no connectors, just short stubs of wire coming out at each side. I soldered on a couple of BNC sockets. 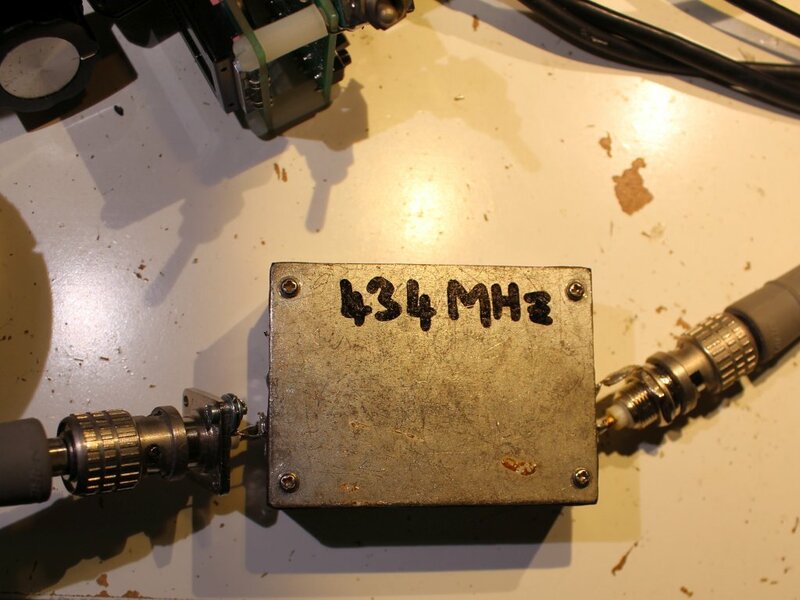 The spectrum analyser showed the box contained a band pass filter resonating at 434MHz. That's why I wrote "434MHz" on it with a black marker pen. See photographs and spectrum analyser shots below (click for larger images). The insertion loss at 434MHz was 2.60dB, although maybe not completely accurate since I did not do a calibration run on the spectrum analyser. Note the unimpressive stopband attenuation, particularly at frequencies up above the passband. No doubt this is due to my rough experiment just soldering some BNC connectors roughly on each side of the filter. I retuned it for 500MHz just for fun and I liked the shape of the curve better there. Part of my reason for re-tuning it was that when I opened the box I noticed that two of the variable capacitors were at maximum capacitance. So I put them in the middle of their range and adjusted things for a nice shape and low insertion loss etc. That came out at about 500MHz. 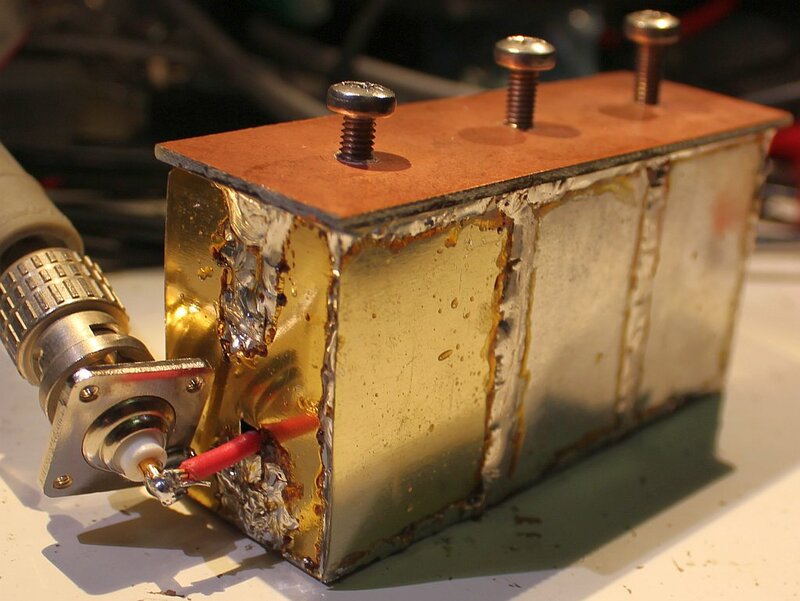 Here are some measurements, that lead to a conclusion of a 3dB bandwidth of about 66MHz. 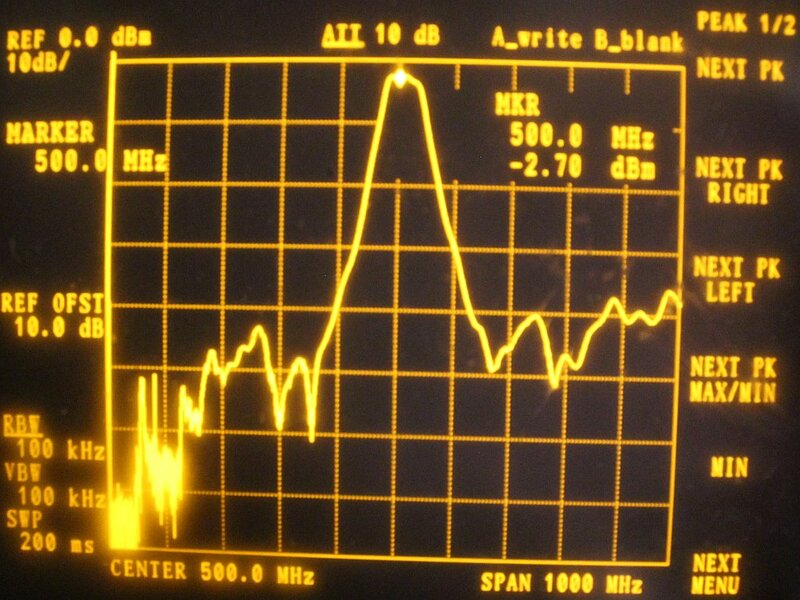 This is one I made myself, some years ago, before I had the spectrum analyser. It was to be part of the multiplier chain to get from a 24MHz crystal oscillating in a 5th overtone Butler oscillator configuration on 120MHz, and doubled (3 times) to get to 960MHz as a reference for an AD9910 DDS chip. 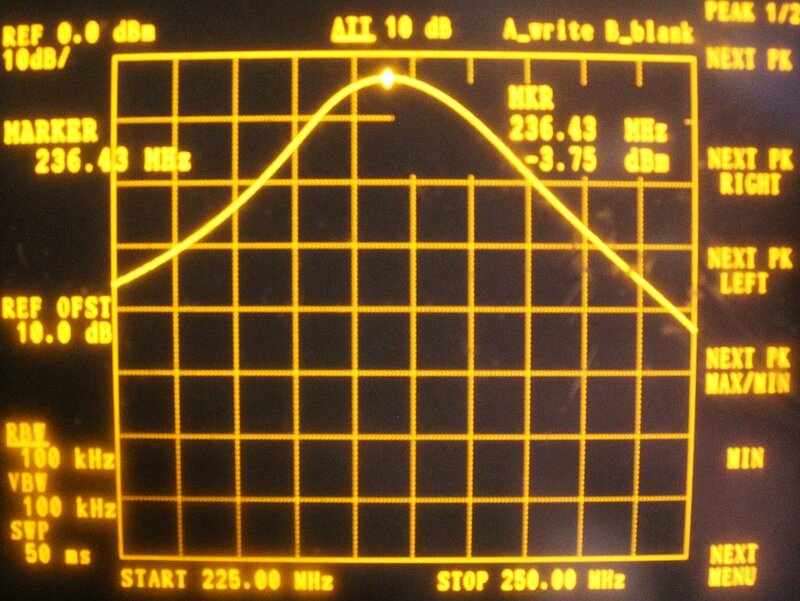 This filter was the 240MHz one. 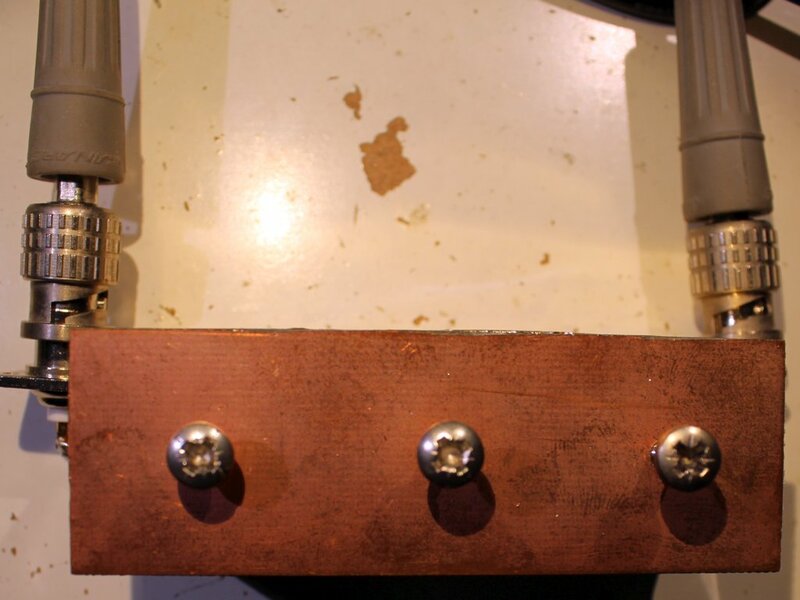 The filter was constructed using one piece of double-sided PCB, with holes drilled for the adjustment bolts. All the other sides of the filter and the individual chambers inside were made with tin can cut from food cans. Again I soldered a BNC connector roughly to each side, so I could connect the spectrum analyser. 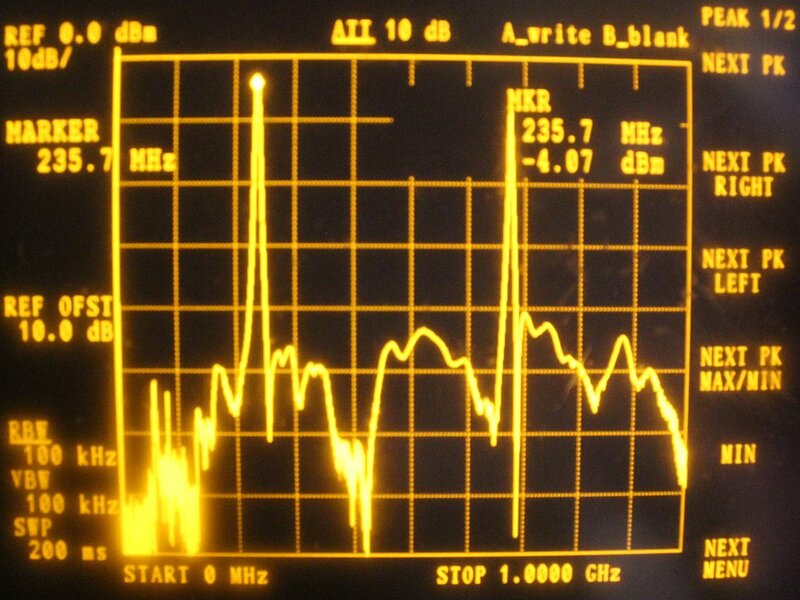 See photos and spectrum analyser shots. 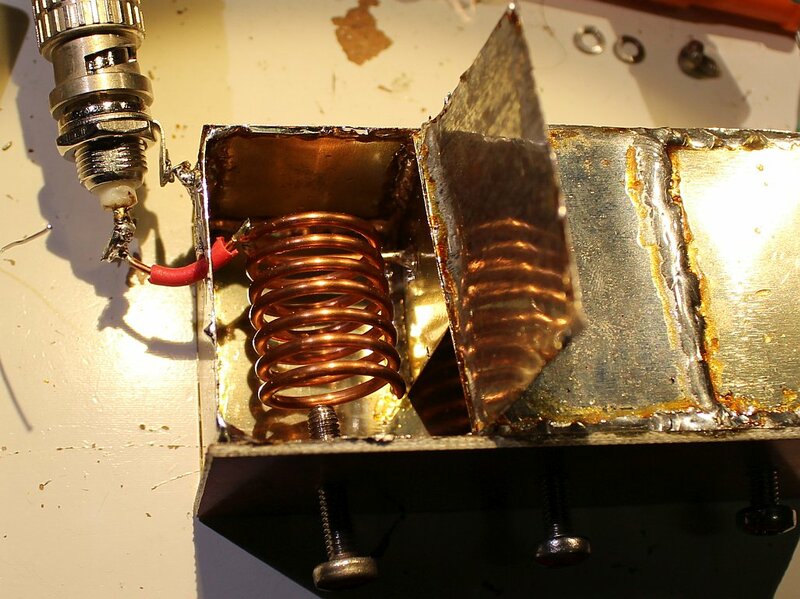 One of the photographs shows one of the helical resonator chambers opened to show the internal construction. I found that the bolts did allow adjustment to get the filter onto 240MHz but that was with the bolts nearly all the way out. So perhaps the thing wants to resonate a bit below that. Nevertheless the test result is very close to the design target. 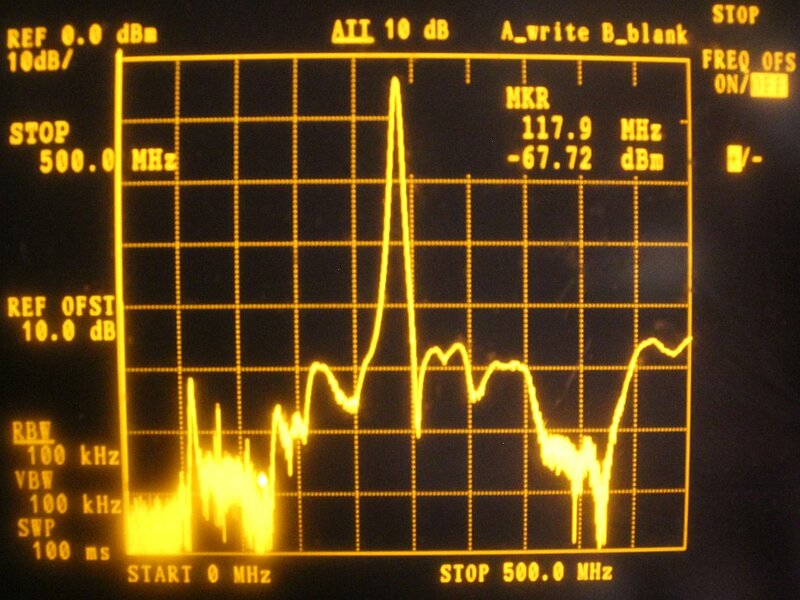 Some measurements indicate a 3dB bandwidth of about 4MHz. This filter was designed using a helical resonator filter designer program by Tonne Software - click here to visit the relevant page.